led to a project with The Metropolitan Museum of Art. In 1994 John Dowdall and I spent a week in New York at The Metropolitan Museum of Art rehearsing and then performing a concert featuring rare instruments from The Metropolitan Museum’s collection. A prestigious Solo Recitalist Fellowship from the National Endowment for the Arts provided this opportunity. At that time, Research Curator of the Musical Instrument Division Laurence Libin suggested that we make a compact disc recording of these instruments. After a few years of planning and negotiation, the project became a reality. From January – June 1998, four rare flutes and three rare guitars were delivered to the Heartland (Cedar Rapids, Iowa, to be exact). They were housed in the security of the Cedar Rapids Museum of Art, and there I practiced in the galleries over a 6-month period. In June, 1998 John Dowdall, Amy Boland and I played a formal concerts in Iowa and in New York and followed with a recording session. The resulting compact disc recording, titled Crystal to Gold appeared in March, 1999, on the Fleur De Son Classics record label. The “stars” of this recording are seven rare and beautiful nineteenth-century flutes and guitars from the collection of The Metropolitan Museum of Art. 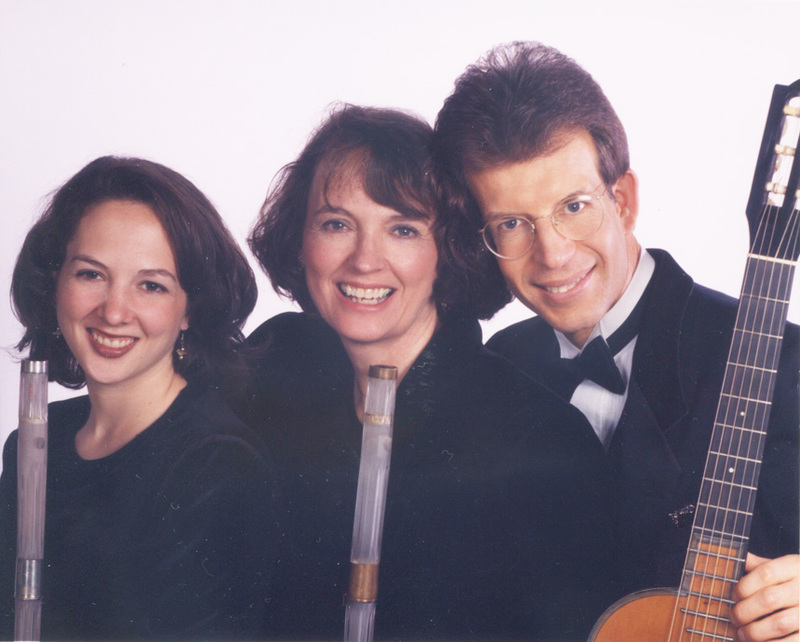 Our association with these instruments was stimulated by National Endowment for the Arts Solo Recitalist Fellowships we each received in 1992 to promote our careers as a Duo specializing in early 19th-century salon music performance on period instruments. 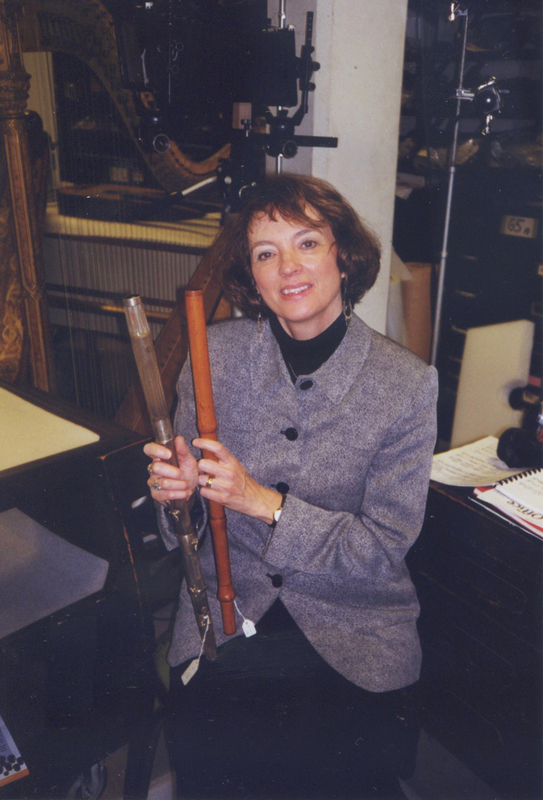 We arranged with Laurence Libin, curator-in-charge of the Department of Musical Instruments at The Metropolitan Museum, to spend a week at the museum in 1993 selecting instruments for use in performance at the museum. We selected instruments based on the reputation of the maker, playability, physical beauty, and above all on their sound quality and beauty of tone. Prior to our performance for patrons of the museum in May of 1994 we again spent a week at the museum acclimating ourselves to the unique demands of each instrument. Following our 1994 performance Laurence Libin suggested that a recording on the instruments would make a wonderful project. The opportunity to capture the sound of each of these rare instruments so that future generations of museum goers could appreciate their true voices, in addition to their visual beauty, was extremely appealing to us. In 1996 we initiated a collaboration between The Metropolitan Museum of Art and the Cedar Rapids Museum of Art to bring the instruments to Cedar Rapids, Iowa between January and June of 1998 to allow sufficient time with the instruments to prepare this disc. Staff members at both museums put in tremendous effort to repair, transport, and care for the instruments so that we could make our visits to the Cedar Rapids Museum of Art to practice, perform and ultimately record this disc. We hope that with careful listening you will become familiar with and appreciative of the sound quality of each individual flute and guitar as we did in the magical six months we spent with these precious art objects. Boxwood flute by Firth Hall & Pond. New York, 19th century. A-440. One square brass key. Gift of Robert Alonzo Lehman, 1991. Accession number 1991.349.7. The Metropolitan Museum of Art, New York. Crystal flute by Claude Laurent, Paris, 1813. Stamped Laurent á Paris/1813. Circa A-420. Four fluted glass sections, blue glass cap, brass rings, 4 keys. The Crosby Brown Collection of Musical Instruments, 1889. Accession number 89.4.924. The Metropolitan Museum of Art, New York. Crystal flute by Claude Laurent, Paris, 1815. Stamped Laurent á Paris/1815/Brèvete. Circa A-420. Four fluted glass sections, blue glass cap, silver rings. 4 keys. Gift of Mrs. John Manuel Agramonte, in memory of her husband, 1916. Accession number 16.130. The Metropolitan Museum of Art, New York. Wood & gold flute by Jean-Louis Tulou, Paris, c. 1852. A-440. 8 keys. Lent by Stuart Pivar, 1992, and courtesy of The Metropolitan Museum of Art. The Metropolitan Museum of Art, New York. The simple boxwood flute by Firth Hall & Pond of New York dates from the mid nineteenth century. It has a “big” sound by comparison to the French instruments discussed below, and particularly favors the low range. As a player, I found it advisable to stay in keys using 1-3 sharps, as some notes (especially f-natural) are remarkably out of tune. This one-keyed flute was well-suited to lighter tuneful music. The Stephen Foster songs seemed a good choice. The flute is stamped Firth Hall & Pond / Franklin Sq. / N. York; this workshop was active from 1833-1847. The Laurent crystal flutes generated a great deal of public curiosity during this project. Concert-goers wanted to see how the flutes looked and sounded. These flutes settled in best at circa A-420. The flutes are a bit heavy to hold and play for a long time. Additionally, the player must manipulate the embouchure and air-stream a great deal to tune the intervals. The sound is much bolder than I expected and the flutes project a distinctive, colorful tone. They are also remarkably flexible. This recording marks the first time that two crystal flutes have appear together on a compact disc recording. The Haydn Flute Clock pieces suited the crystal flutes well. Both crystal flutes are by the French maker, Claude Laurent (d. 1848), who began making crystal glass flutes in 1805, and won a silver medal at the Paris Exhibition in 1806. He exhibited at additional festivals including the 1834 festival where it was said he was working at making his flute less heavy. Laurent’s flutes were very expensive and highly prized; France presented one as a gift-of-state to President James Madison during Lafayette’s visit to the United States. The Laurent flutes on this recording are four-keyed instruments dated 1813 and 1815 (Laurent also made flutes with eight and nine keys). The lowest note is d-natural. 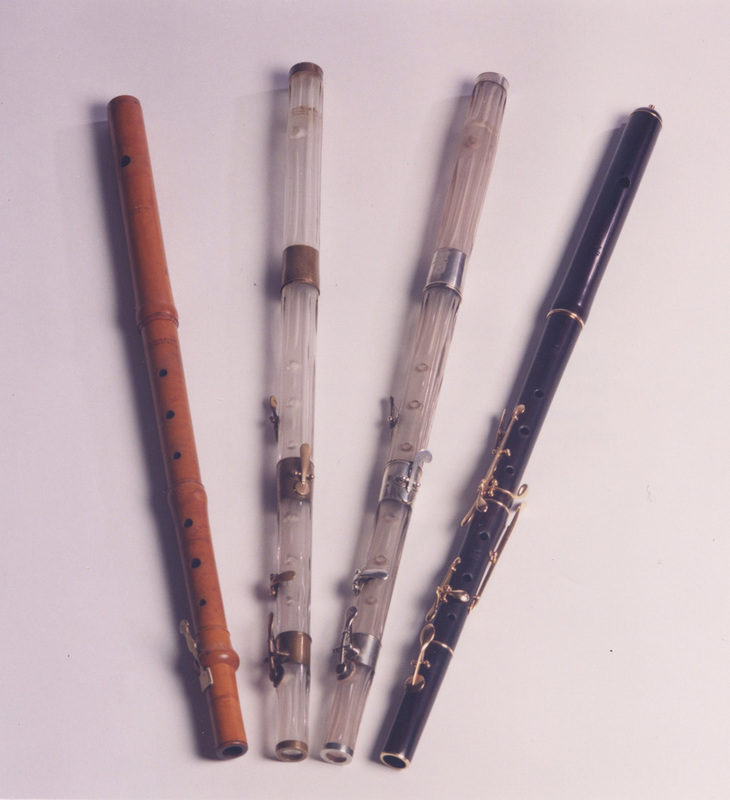 Each flute features four fluted glass sections, five rings, and a blue glass cap. The 1815 flute has rings and keys of silver; the 1813 flute, of brass. The Tulou flute on this recording is an exquisite instrument to view, to play, and to hear. The key-work is artful and fits the hands beautifully, allowing for fluid playing of quick slurred passages over the full range of the flute. Of the flutes on this recording, the Tulou flute is my flute of choice. The flute’s intonation allows the player to explore many keys. The tone is somewhat small, but voice-like and expressive. For the repertoire on this compact disc recording, I incorporated a number of notes sensibles- resulting in “expressive intonation” with leading tones which are often as much as a quarter-step high in pitch. The Tulou flute in this recording is of grenadilla wood with four sections. The key work is of gold. The lowest note is d-natural. It has been dated c.1852. It seemed happy to play at A-440. This flute sports Tulou’s new f-sharp key, designed to bring the pitch of the f-sharp in all octaves up a bit. Jean Louis Tulou began manufacturing flutes in Paris in 1828. In 1831 he formed partnership with Jacques Nonon that lasted 22 years, until 1853. In the late 1830s his flutes featured only 5 keys, but at some point in the early 1840s he was making his flüte perfectionnée. Tulou wrote a method book, Méthode de Flûte (c.1835), that describes this “perfected” flute and the performance style appropriate for the music of this period. Jan Boland in the Rare Instrument Room of the Metropolitan Museum of Art. Pictured with boxwood flute by Firth Hall & Pond and a crystal flute by Claude Laurent. It was 1982 and Jan Boland and I were in search of flutes and guitars appropriate for the flute & guitar duets we collected from the Library of Congress (see Jan’s story above). I read about the characteristics of early nineteenth-century guitars—bracing, relative size, etc-looked up, and saw that I had one hanging on the wall of my studio. I had purchased this particular guitar 6 years earlier at an auction house in Vienna. The fine-crafted little instrument had been covered with dust and its label read “Hasslwanter, Innsbruch”. The starting price was US$15—I bid someone up to US$40 and became its new owner. This guitar has served my needs as my nineteenth-century instrument-of-choice for the past 18 years. 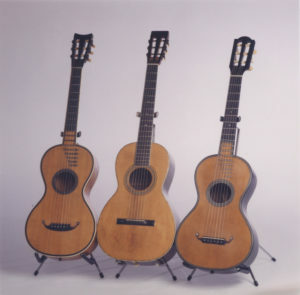 What follows are my comments about three rare guitars from the collection of The Metropolitan Museum of Art that I had the privilege of playing for a six-month period in 1998. Guitar by Mauchant freres, France c.1830. Total length: 93.2cm. Body length: 45.5cm. String length: 64cm. Body depth at tail: 8cm. Purchase, Gift of Louis C. and Craig P. Baker, Clara Mertens Bequest, in memory of André Mertens, Rogers Fund and the Crosby Brown Collection of Musical Instruments, by exchange, 1990. Accession number 1990.218.1. Guitar by Christian Frederick Martin, Nazareth, PA, c.1867. Total length: 94cm. Body length: 46.6cm. String length: 62.5cm. Body depth at tail: 9.5cm. Gift of Louise Ransom, 1983. Accession number 1983.348. Guitar by Rene Lacote, Paris, ca. 1825. Total length: 93cm. Body length: 43.5cm. String length: 63cm. Body depth at tail: 8.6cm. Purchase, Clara Mertens Bequest, in memory of André Mertens, 1992. Accession number 1992.1.1. Anonymous, German, c.1850-1860. Total length: 94cm. Body length: 45cm. String length: 62cm. Body depth at tail: 8cm. Private collection of John Dowdall. The most delicate of the instruments both in terms of its condition and its construction was the Mauchant. Mauchant, a Parisian builder who is little remembered today, used birds-eye maple on the back and sides of this instrument and a spruce top which like the Lacote has an extension notched into the fingerboard. Typical of many nineteenth-century French instruments, the back is laminated with spruce on the inside. 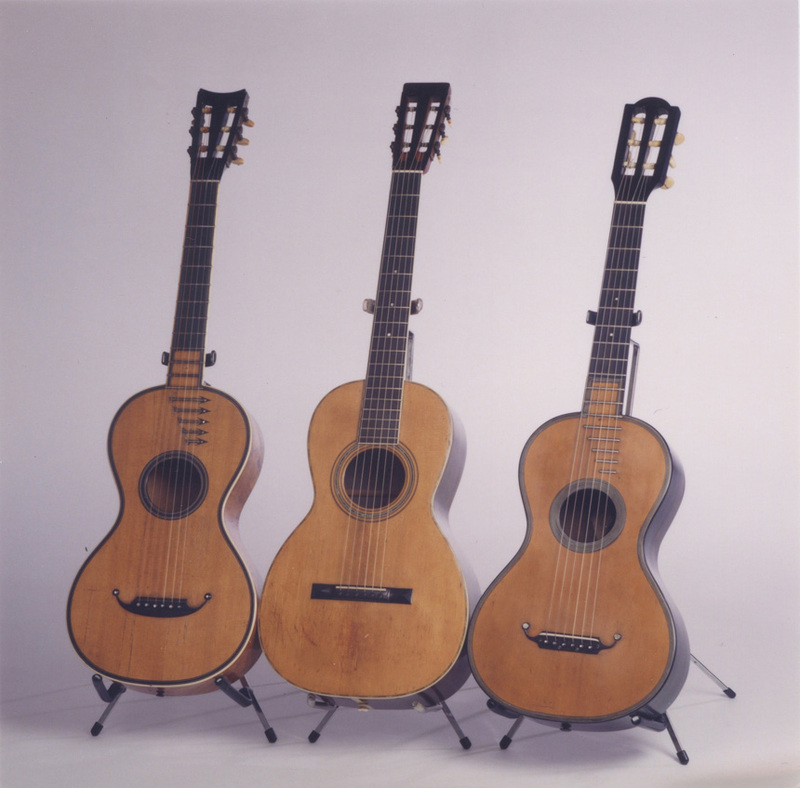 With the Lacote and the Martin, I was able to put considerable energy into the strings without distorting the tone, but the Mauchant required a lighter touch and was the quietest of the three instruments. This guitar’s most curious feature is mother-of-pearl arrows inlaid on the top pointing downward away from the frets. I have no idea what the significance of these markings is. Mauchant has engraved his name on the rib at the tail of the instrument on each side of the strap button. The Mauchant and Lacote also share the typical French “mustache bridge.” Although delicate, I found the tone to be clear and attractive, and the balance of bass and treble was good. Christian Frederick Martin (1796-1873) learned guitar building in Markneukirchen, Germany and worked in Vienna with Johann Georg Stauffer before emigrating to America in 1833. The Martin guitar company is still one the most respected producers of American guitars, although they now deal almost exclusively with steel-stringed instruments. This instrument is based on the Spanish design with rosewood back and sides and spruce top. It is the largest of the three Metropolitan Museum instruments, particularly in regard to body depth, and it has a rich contralto quality to the sound. This guitar has a fuller sound and projected better than the two French instruments. Its body depth, fret board extending over the soundboard, and full tone all place it as the latest of the three instruments, most likely having been built in the second half of the nineteenth century. Its noteworthy features include a slightly convex fretboard (typical of certain steel-string instruments, but rare on classical guitars) and fretboard inlay markers which are placed right next to the frets. René-François Lacote (c.1785-1855) was a Parisian builder who earned the respect of Fernando Sor for his guitar making skills and his openness to listening to Sor’s suggestions on guitar construction. His instruments are superbly crafted and many survive in excellent condition today. The Metropolitan Museum’s Lacote is a beautiful example of his “top of the line” instrument which includes the elegant méchanique fermée design where the gears of the machine heads are enclosed in the head and the tuning pegs are not visible from the front as they extend to the rear. Lacote á Paris is engraved on the head and F. Sor is still visible on the label inside the guitar. According to Sor scholar Brian Jeffery, numerous Lacote instruments “signed” by Sor exist, however the signature does not appear to be authentic. This instrument was a delight to play and has a wonderful singing treble and an excellent balance between treble and bass. The back and sides are of dark rosewood and the spruce top has a notched extension into the fretboard which is flush with the soundboard. The instrument’s sole weakness was that it was impossible to get all the octaves in tune at the same time, so I was always forced to compromise when tuning. Concert artists for the project were flutist Amy Boland (Hunzelman), flutist Jan Boland and guitarist John Dowdall.